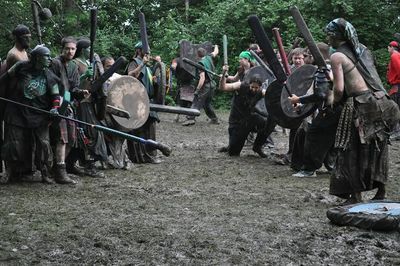 Battlefield at Armageddon X, one of the many National Events of Belegarth. New to Belegarth? Get Started Now! The BelegarthWiki is an open source project created, written, & edited for the Belegarth Medieval Combat Society and its friends in medieval sports and other organizations. Belegarth is a full-contact sport where participants engage in combat using foam padded representations of medieval weapons. The Wiki is a free encyclopedia that anyone can edit, and the intention is to house as much knowledge that is available about the colorful social creations, customs, & history of our society and its people. We encourage everyone to upload images of our sport, as well as share ideas and unique group histories. If you'd like to get started with the site, use the search bar above, navigation at the left, or visit our Community Portal. There are still a lot of requested submissions. Check out the list of most requested entries, or try expanding these units, people, and realms. If you want to add an entry use the search bar on the top to search for it. Then click on "create this page" in red and start writing your article. For more help on how to create a page, please see this simplified guide to Wiki editing. This page was last modified on 2 April 2014, at 20:33. This page has been accessed 1,472,324 times.